He's been in the country a day, and already America is fast on its way to falling in love, thanks to some of Pope Francis' best moments in Washington, D.C. It's not surprising the pope has been popular with crowds, considering the staggering popularity he has among Catholics and non-Catholics alike. But the American people might have underestimated how adorable and truly inspiring the man could be. Starting with an intense speech at the White House and some wonderful photo ops with the first family, Pope Francis took D.C. by storm. The streets were lined with thousands of well-wishers and supporters, just waiting to catch a glimpse of him, and even more were tweeting him welcome messages (because, in case you missed it, the pope is on Twitter). Pope Francis' staggering humility and dedication to reforming the Catholic Church has made him a highly controversial yet deeply beloved public figure over the past two years of his papacy. While his first day in the United States was a perfect example of why Catholics love him, his coming days will be markedly more controversial as he addresses both Congress and the United Nations. But why is he making such a large impact in America? I'm sure some of these moments have something to do with it. Never before has a Fiat hatchback been so popular. But Pope Francis chose the simple car as his popemobile of choice while driving around Washington as a statement against the opulence and wealth of the nation's capitol. And he looked adorable while doing it. The pontiff's White House speech was packed with important details concerning politics and faith, but his comments on climate change were particularly moving. Mr. President, I find it encouraging that you are proposing an initiative for reducing air pollution. Accepting the urgency, it seems clear to me also that climate change is a problem which can no longer be left to a future generation. When it comes to the care of our "common home," we are living at a critical moment of history. We still have time to make the changes needed to bring about "a sustainable and integral development, for we know that things can change" (Laudato Si', 13). Such change demands on our part a serious and responsible recognition not only of the kind of world we may be leaving to our children, but also to the millions of people living under a system which has overlooked them. Our common home has been part of this group of the excluded which cries out to heaven and which today powerfully strikes our homes, our cities and our societies. To use a telling phrase of the Reverend Martin Luther King, we can say that we have defaulted on a promissory note and now is the time to honor it. When He Gave Washingtonians A "Pope Day"
Because of the insane traffic expected as a result of his visit, workers were encouraged to take the day off or work from home. Some Washington schools were excused for the day, blessing children with a papal snow day. Now that's the way to bring a new generation to religion. Five-year-old Sophie Cruz was on a mission Wednesday to meet the pope because she had a very important message for him. During the papal parade, she broke free of the barrier and, despite security detail trying to keep her back, made eye contact with the pope, who gestured for her to come forward. After the pope hugged her, Cruz handed him a T-shirt and a handwritten letter in which she asked him to work on immigration reform. "I want to tell you that my heart is sad," Cruz's letter said in Spanish. "I would like to ask you to speak with the president and the Congress in legalizing my parents because every day I am scared that one day they will take them away from me." The pontiff met Bo and Sunny, the Obamas' dogs, and there's an adorable photo as evidence. While we don't know for sure that he blessed them, he at least pet them — and being touched by the pope is basically a blessing anyway. 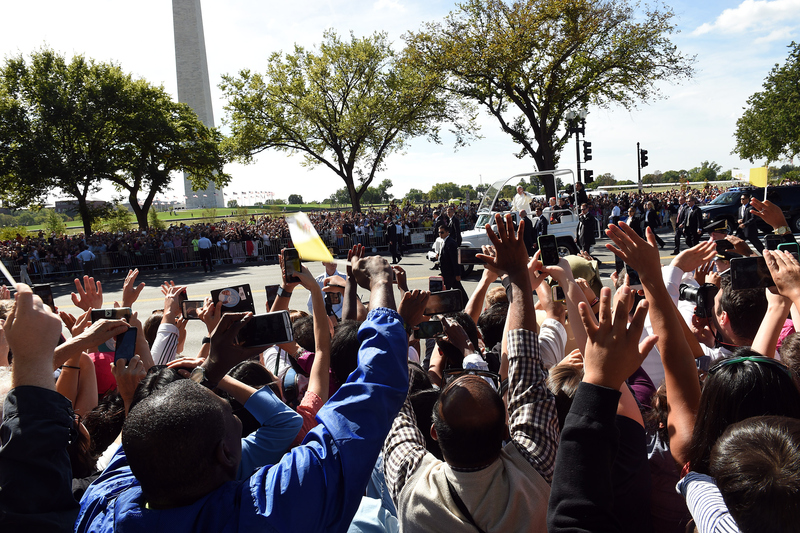 At the end of his statement at the White House, Pope Francis said, "God bless America." The phrase somehow means a lot more when coming from the pope. If you take it literally, everyone in America is blessed now — including Bo and Sunny. Like many of the pope's fans, there were quite a few nuns camping out in advance to catch a glimpse of the Holy Father and take part in his first U.S. mass. But these tailgating nuns absolutely get extra points for style. And I would personally like to thank Pope Francis for bringing this photo into existence. As the pope tackles day two of his Washington visit, there are sure to be plenty more heartwarming and inspiring moments. His entire American schedule will probably include dozens of opportunities for baby blessing and nun tailgating. But here's hoping his New York popemobile is half as wonderful as the Fiat.